ysabetwordsmith | Poem: "In That Terrible Inbetween"
Poem: "In That Terrible Inbetween"
This poem was inspired by prompts from goldbach5, callibr8, and ellenmillion. It also fills the "depression" square in my 3-1-17 card for the Disability Bingo fest. It has been sponsored by goldbach5. This poem belongs to the Officer Pink thread of the Polychrome Heroics series. In the timeline, it happens after "Proximity and Separation." Warning: This poem contains some intense topics. Highlight to read the warnings, some of which are spoilers. Nebuly has sleep disturbances due to his past imprisonment and torture, experiences that left him with PTSD and depression. He thinks about death as an end to torment, but doesn't act on those thoughts. Instead he struggles to recover, even though getting out of bed is a major challenge for him. Hankie warning for trauma survivors. If these are sensitive issues for you, please consider your tastes and headspace before reading onward. but every night, the past drags him back. even with help from his friends. to squeeze the breath from him. he is secretly grateful for their comfort. just ... become dead somehow. it's the only way to end his suffering. He never acts on these ideas. that's left to live for. is a victory over the ones who imprisoned him. the Breton Faire outside the windows. he does in a day is get out of bed. Nebuly (Darian Cormac) -- He has pale skin and gray eyes. 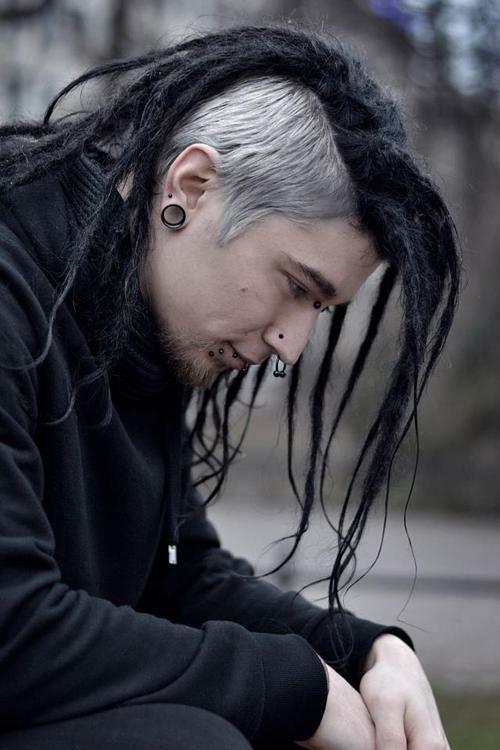 His hair is short and white on the sides of his head, while the top has a row of long black dreadlocks. His body hair is patched and swirled in black, brown, and white. He is tall and strong. He has a stretched lobe tunnel and upper lobe piercing in each ear. 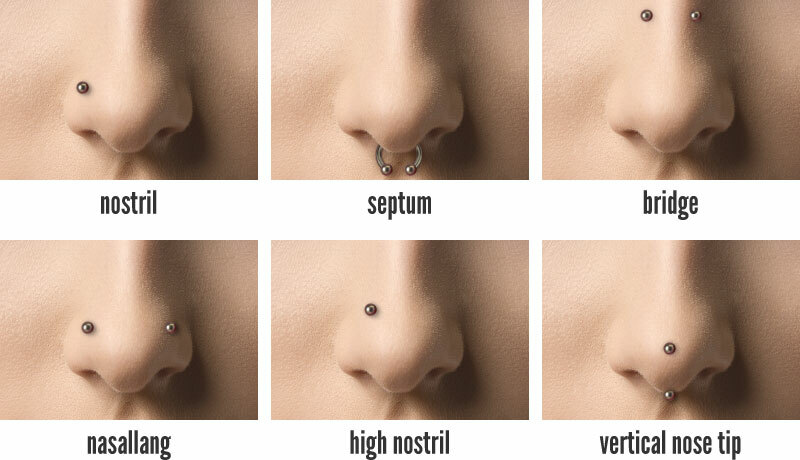 He has bridge, both nostril, and septum piercings in his nose. 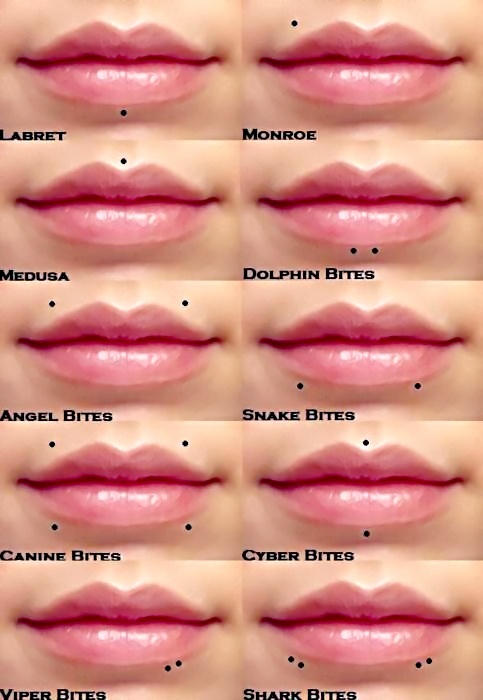 He has a labret, snakebites, and two pairs of corner piercings in his lower lip. Nebuly uses the occasional pain from piercings to break through the numbness of depression and remind him to take good care of himself. His BlackSheep handle is Bagwyn. Darian grew up in a happy, healthy family until he and his parents were attacked by human traffickers when Darian was 10. His parents fought ferociously to protect him, and managed to kill at least one of the attackers. Due to all the blood spilled, Darian suspects that his parents were also killed, and doesn't really want to find out the truth. He is about 21 now. Origin: Mad science torture. The supervillain Carl Bernhardt locked Darian in a strange metal chamber and bombarded him with mysterious energies that caused his body to warp. He escaped when he finally manifested Vaporous Form. Now he works as a rennie and occasionally as a hacker. Uniform: Street clothes. He usually wears black. Sometimes he lightens up with white, gray, or brown. Rarely he wears brighter colors like blue or purple. He also has some medieval garb. In Nebuly's case, the metapower of Cryptid Shifter includes various abilities and variable enhancements to vision. Good (+2) Control Electricity (Signature Stunts: Average EMP, Average Lightning Bolt, Average Neural Disruption), Good (+2) Regeneration, Good (+2) Shapeshifting, Good (+2) Vaporous Form (Signature Stunt: Average Liquid Form), Average (0) Merle, and Average (0) True Sight. 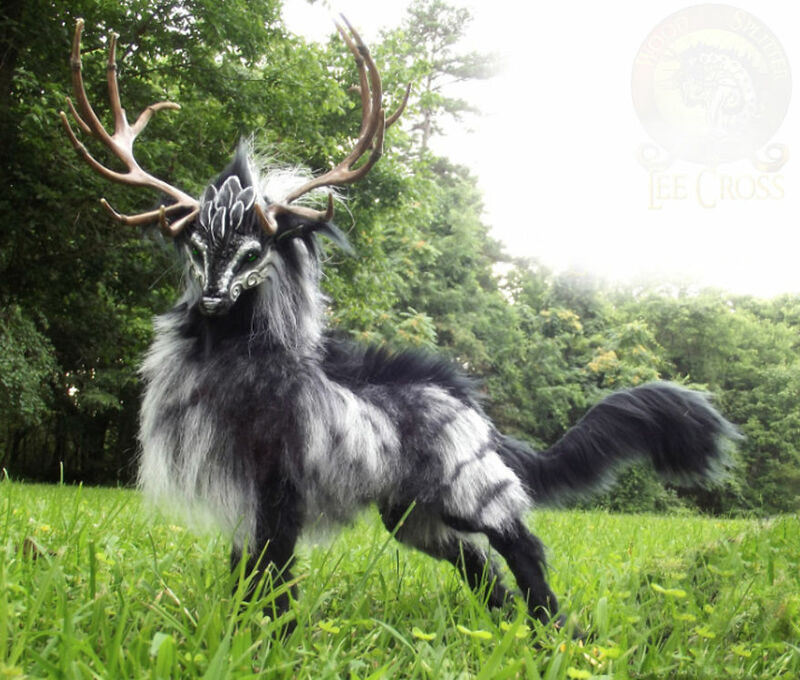 His alternate forms include myrstag. Motivation: To put his life back together. In heraldry, a line nebuly (or nebulée) is drawn with deep curves meant to resemble clouds. The term comes from the Latin word nebula, "a mist, vapor, or cloud." Here is heraldic shield displaying Barry nebuly of nine azure and argent. The myrstag form has sharp antlers for defense, a heavy coat which sheds rain, hooved paws for walking on soft ground, and the ability to digest almost anything. The outer guard hairs are coarse and wiry; the middle hairs are silky; and the woolly undercoat is soft. Myr is Swedish for a bog, a moor, or a wetland. The myrstag has a musky scent. Amergin (Alroy Sheach) -- He has pinkish-fair skin, green eyes, and short curly chestnut hair. He uses his faire name pretty much all the time now. His family pronounces their surname as "shuck" although other branches say "sheech" or "sheeck." He speaks Beurla Reagaird, Cornish, English, French, Irish Gaelic, Italian, Manx, Spanish, and Welsh. His heritage is Irish, Scottish, French, and American. His parents work the Renaissance Faire circuit; his mother is a blacksmith and his father is a silversmith. He is the husband of Marjoram. Amergin is homefree and a dedicated rennie with the Caravan Driver skill. He is a bard who plays bodhran, clairseach, guitar (both six and twelve strings), lute, mandolin, recorder, pennywhistle, and shawm. He can play the three strains (Geantraí for merriment, Goltraí for sadness, and Suantraí for sleep) of bardic legend, although currently at ordinary rather than super level. This helps his friend Nebuly to manage his moods. Marjoram (Mary Jane Grader) -- She has fair skin with freckles, hazel eyes, and long hair of reddish-gold. She has a sturdy body with small breasts and hips and little waist definition. She uses her faire name most of the time. Her heritage is Irish, British, and American. Her father is a professor of literature and her mother is a bohemian shopkeeper. Marjoram is the wife of Amergin. She works the Renaissance Faire circuit as an herbalist, although she still has a room in her parents' house. She invented the Gypsy Moon Tea for her friend Nebuly to help him sleep. A dedicated rennie, she has the Caravan Driver skill. She loves people and has an impish sense of humor. Dr. Evan Gentry -- He has fair skin, sky-blue eyes, and dark hair turning silver. He is tall and physically fit. He likes athletic activities such as hiking and cycling, along with a casual interest in sports. Dr. Gentry enjoys gardening and has helped design some sanctuary gardens. He lives in Clearwater. Dr. Gentry does community and pastoral counseling out of a church. 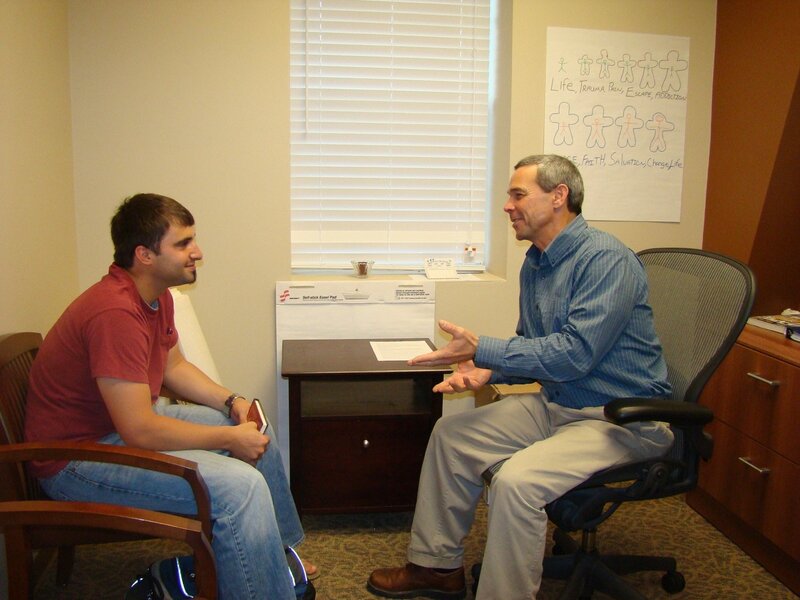 The program primarily focuses on traumatic stress and related conditions such as addiction. He started out working as a psychiatrist for a major medical facility, but it didn't suit him at all; he felt like he didn't have enough time with his clients to do them any real good. So he switched to nonprofit work and added spiritual aspects to his skillset. This is much more satisfying for him, and his clients generally see a lot of improvement in his care. Dr. Gentry is definitely not an artist, though -- he tries to use illustrations on flip charts and so forth, but they're sketchy at best. He is Nebuly's therapist. 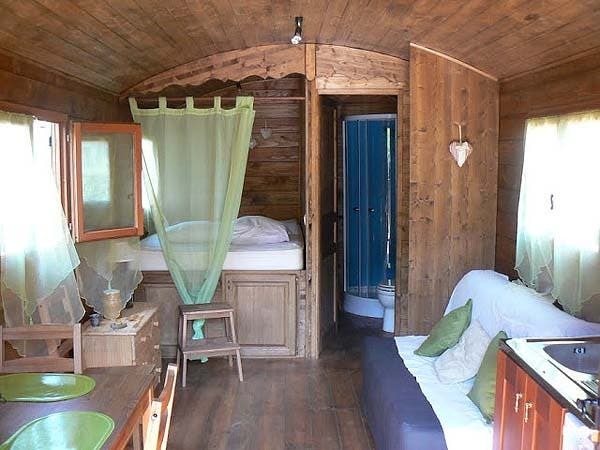 See the exterior and interior of the vardo that Amergin and Marjoram share. Such vardos appear occasionally at Renaissance faires in local-America, but they are considerably more common in Terramagne-America. Vardos began as horse-drawn wagons used by the Romani people. They have since become popular with other folks, such as the tiny house movement. 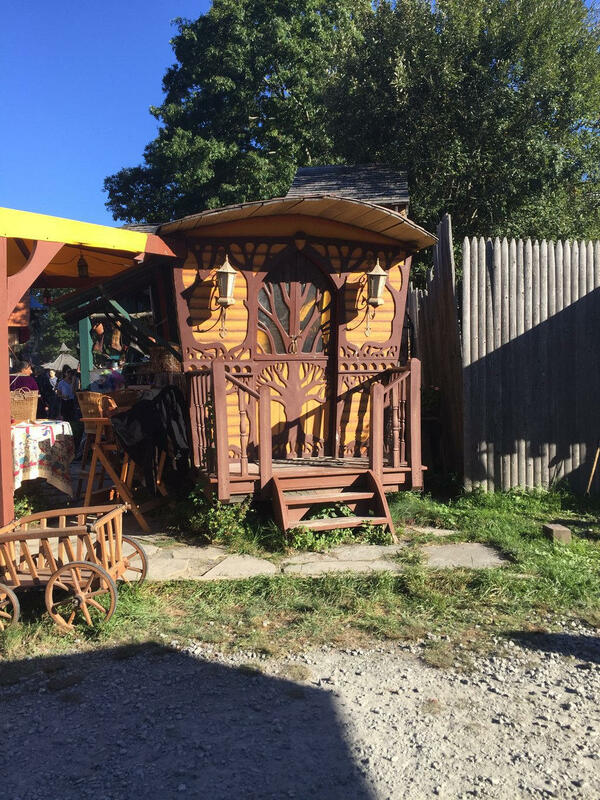 In T-America, Romani vardo makers are still prized as experts, although plenty of other people now make them. Torture can have lasting health effects, one of which is depression. Rehabilitation offers challenges for clinicians. Sometimes energy work helps, such as qigong or t'ai chi. Caregivers can help survivors of torture, and there are self-care steps for survivors too. Similarly, human trafficking impairs access to support networks. Traumatic stress can lead to conditions such as post-traumatic stress disorder or prolonged duress stress disorder. When children or adolescents suffer extended hardships, this can cause developmental trauma disorder, as the abuse and/or neglect prevent some physical or psychological features from growing in properly. This is a different problem than when trauma disrupts the mature systems of an adult. Nebuly had a loving family before he was violently kidnapped and subjected to mad science torture, so at least he understands what healthy relationships look like. He's just messed up from the maltreatment. There are ways to cope with traumatic stress or live with someone who has it. Depression can be a mental illness (arising from within) or a mental injury (caused by an outside force). Child abuse and neglect cause changes in the brain which increase the risk of mental issues in general. Torture is prone to cause PTSD, exhaustion, impairment, and depression. There are many different ways to overcome depression and to support someone through it. Nightmares often come with PTSD or depression. There are ways to stop having nightmares, or comfort someone after a nightmare. "The Nightmare" is a famous painting which depicts an ugly creature sitting on a woman's chest. Depression may bring persistent thoughts of death, but this is not necessarily the same as suicidal ideation. Even wanting to die is not the same as being suicidal. Existential depression is particularly prone to obsessing over morality and the meaning (or lack thereof) in life. Learn how to deal with an existential crisis. Nebuly derives leverage from a focus on thwarting his abusers just by continuing to live. Meadowsweet is an herb that grows in damp fields, associated with magic and faery. Breton refers to the people, language, and other aspects of Brittany. Lyonesse comes from the Arthurian Cycle with French, Scottish, and Cornish input. Depression often makes it difficult just to get out of bed, which means doing so is an act of courage. Here are some things that depressed people have found useful for prying their their body out of bed. Just like getting out of bed is for Nebuly. Re: Hard, but worth it! Yay! I'm glad this poem paid off for you. He's doing better, really. It's just a long road. ...if nothing else, eventually I'm gonna hafta pee. In fact, that's something I want to bring up later, after the initial meeting between Nebuly and Ansel. When Nebuly has trouble getting up in the morning, Ansel suggests aiming for just one hour: enough time to move around some, use the bathroom, and eat breakfast. That's often enough to break the inertia and enable more activity. If not, at least the immediate physical needs are taken care of. Just lying in bed, those only get worse. Even staying up for fifteen minutes, enough to pee & stoke the fire & check the cats' food, is often enough to keep me out of bed. Thanks for the vote of confidence! It really helps when people confirm that something I'm writing about fits their lived experience. Lovely work again, ysabet. Thank you. Yay! I was really glad to find something on that topic by and for depressed people, who have a very different perspective than what the usual advice covers. I really want to get Nebuly introduced to Ansel. One of the later scenes I have of the two them is Ansel talking Nebuly out of bed in the morning with very practical arguments: get up, visit the bathroom, eat breakfast, and if you still feel like crap then go back to bed. Because if you don't get up, your body's needs will just get worse, making you feel even more like crap. Sometimes, moving around will generate a little energy and you can do more stuff. If not, you can lie back down and at least the physical essentials are out of the way for a few hours. i just got back from work and read your poem. all i can say is WOW WOW and WOW. more thoughts later. I get up at 4 am so i need my sleep. Nebuly is a relatively new character, who ties into the storyline with Officer Pink and Turq. I want to get them together later, so this is continued setup for that. Heh. This is akin to the state I jokingly call grenade watch. See, if someone throws a fragmentation grenade, and you're close enough to throw yourself on it, it's usually a no-cost decision to do so. You're already in the kill zone, and won't get out. (This changes if there's hard cover, of course.) If you throw yourself on the grenade, all the suffering ends and you don't burden your friends and family with suicide... this is heroism. Because you'll contain the explosion; you'll be the only one to die; I'm 99% sure even the Catholic Church would grudgingly admit that this is not suicide, even if performed by someone who wanted to die, and realized this was the quickest, easiest way to do so. And the whole "I don't want to kill myself, but..." is where I joke that I'm keeping a careful watch for grenades. On good days, I say it's because it'd be a tragedy if a grenade killed someone with reasons to live; on bad days, I joke it's because I don't want to let a grenade go to waste. This makes perfect sense to anyone with a heroic or military perspective. Exactly. But there's another version, which was routine in Viking culture but still pops up among veterans today: the wish for a meaningful death. Such opportunities abound on a battlefield, but not in everyday life. If one wishes to die in combat or other valiant action, but has survived one's tour of duty, then this becomes a serious challenge. I have known of old veterans who really did not want to die in bed, and who thought of suicide as a waste or personal failing, and some of them sought out risky jobs, hobbies, or volunteer positions. There is a subtle but important difference between being suicidal, and preferring a good death to a slow pointless one. Or grenades. It's funny to most military folks. Pretty sure Nebuly’s stories were added since the last time I went through the officer pink thread, so these aew new for me! There is a lot of overlap with the mad science victims, because of how it messed up their bodies and minds. It's just a slightly different bucket of symptoms for each individual. dialecticdreamer - Hard, but worth it!